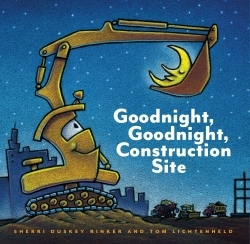 A cement mixer, a bulldozer, and a crane: not your average bedtime protagonists. This sweet rhyming narrative that celebrates the day’s end in an unconventional yet everyday place will convince listeners that there’s a kind of lyricism and reward to the routine of hard work. With the passing of the sun, the book’s colorful, friendly illustrations darken and become quieter, until the moon lights the way to a well-deserved rest for the busy equipment. Even the most resistant children will find themselves in such good company that sleep will seem more welcoming. Ages four to eight.